Also available in French, Spanish, Japanese and Chinese. IAPO, with the International Council of Nurses (ICN), International Federation of Pharmaceutical Manufacturers and Associations (IFPMA), International Pharmaceutical Federation (FIP), and the World Medical Association (WMA) have established a Consensus Framework for Ethical Collaboration to support partnerships that will aim to deliver greater patient benefits and support high quality patient care. Organizations wishing to endorse the Consensus Framework should be able to demonstrate a public commitment to ethical conduct, shared values and promote the Consensus Framework with internal and external stakeholders. 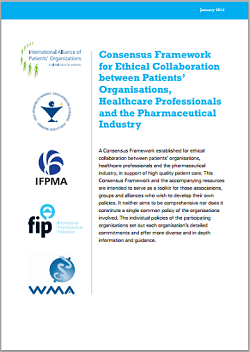 A Consensus Framework established for ethical collaboration between patients’ organisations, healthcare professionals and the pharmaceutical industry, in support of high quality patient care. This Consensus Framework and the accompanying resources are intended to serve as a toolkit for those associations, groups and alliances who wish to develop their own policies. It neither aims to be comprehensive nor does it constitute a single common policy of the organisations involved. The individual policies of the participating organisations set out each organisation’s detailed commitments and offer more diverse and in depth information and guidance.